How difficult is it to land on an aircraft carrier in rough seas? 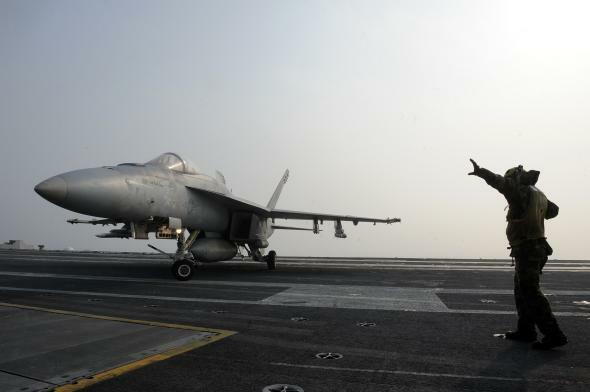 A crew member gestures after an F/A-18E Super Hornet landed on the deck of the aircraft carrier USS George Washington during a joint naval exercise with South Korea in the Yellow Sea in 2010. Pitching deck landings are some of the most challenging semicommon aviation feats. Of course, there are different levels of deck motion, and it seems like it should just keep getting a little tougher with each foot of displacement. This isn’t the case. Displacement matters, but speed is an even greater factor. There’s also a nasty Dutch roll that the ship can pull off that not only messes with the glide slope but also lineup — equally critical, but usually more stable. The main issue is that carrier aircraft use a constant descent rate to fly right into the wires on the ship. There is no flaring the landing to break the rate of descent and soften the blow. This is why they are often referred to as “controlled crashes.” If the deck is coming up too fast, it could add enough to that descent rate to break the airplane. In extreme cases, it may be enough to jump up and smack an aircraft that’s too low, destroying it against the fantail. There have also been incidences of aircraft waving off late, only to have the deck rise up, the cable grabbing the hook while everything is airborne, starting to fly away. The aircraft is slammed back into the deck like a hammer against an anvil. The optical landing system, or “meatball,” is the primary glideslope information for pilots landing aboard carriers. It has inertia stabilization, moving to counter deck motion by use of motor-driven jack screws. However, past a certain deck speed, the screws can’t keep up and will lag the deck motion, so it stops helping and starts hurting you if you fly it. The landing signal officers are trained to know when the deck motion messes up the lens and will start calling the pilot’s position, talking the aircraft right down to the landing. From that point, the pilot is relying on the LSO’s experience and eye in order to get aboard without breaking something. The LSO gives a talk-down, which is almost a chant, a cadence of information, and direction. He gives it all in a smooth, calming, confidant tone. When the deck motion is forecast prior to the recovery, the crews may rig the manually operated visual landing aid system, or MOVLAS. This is a replica of the meatball, placed right in front of the main lens, but it is driven by the LSO, who makes the ball rise or descend, based on where he thinks the airplane is on glideslope. They also train with it on calm seas to help both pilots and paddles get used to it. The major effect with pitching-deck recoveries is that they extend out the time it takes to recover everyone. There are usually wave-offs for the deck motion and until everyone’s aboard, it’s tough to do maintenance or get ready for the next launch. It makes everyone’s day much longer, increasing fatigue, stress, and the attendant danger of mischance. Military aircraft: How many missiles and ammunition are there on an average fighter jet? Flying: Why can’t we just slowly rise to space? Why do you have to go so fast? Aircraft carriers: How quickly can a carrier fleet deplete its ordnance when attacking at full strength?